There is no doubt that copy and content written on a product label are vitally important to get the correct message across. You need to convey what your product is and why it would benefit the consumer. This is often quite difficult to convey given the limited space available on a printed label. If you are worried about the content of your label use the services of a professional copywriter. Authentic label images include high quality, well printed food images. These images need to be consistent across all product items. In order to do this, a professional label manufacturer is needed to ensure consistency and quality of print. Label manufacturers should use an objective, quantifiable way of measuring colour such as a Pantone Matching System or Delta E reading. If your label doesn’t meet the retailer’s packaging guidelines they will not display your product and your product will therefore not sell. Most retailers require nutritional facts to be printed on packaging as well as clear SKU codes to name a few. They may sometimes also need certain materials for certain conditions such as varying temperatures or sun exposure. It is important to find out all these requirements before embarking on your label printing. You may be printing labels for one range of products now but this may expand to other product ranges in the years to come. It’s therefore important to keep your brand consistent from day 1. Consider what elements can remain consistent over time and design your food label bearing these in mind. Consistency doesn’t need to be restrictive however a consistent look and feel builds trust in the brand over time. For more tips on how to create effective product labels, read here. 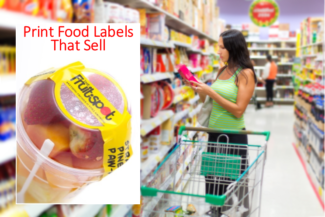 To give you ideas on how to label your food products in 2016 read our article, Label Trends in 2016. It is important to partner with a professional Label Manufacturer to ensure that your food labels are printed correctly, consistently and on time.